If you undertake black or gray hat techniques, you run a fair chance of having your site penalized in the search results. But even if you are not engaged in these techniques yourself, your site may be punished for associating with black hat purveyors. Hosting on a shared server or sharing domain registration information with bad neighborhoods can lead to to ranking problems, if not punishment. Certainly linking to a bad neighborhood can lead to discipline. If you purchase a domain, you’ll inherit any penalties or bans imposed on the prior version of the website. There are a wide range of penalties and ranking filters that search engines impose and a still-wider range of effects that those penalties produce. In diagnosing and correcting ranking problems, more than half the battle is figuring which penalty, if any, is imposed and for what violations. Ranking problems are easy to fix but arduous to diagnose with precision. Sudden drops in rankings might lead you to suspect that you’ve received a penalty, but it might not be a penalty at all. In the following section we’ll look at some specific penalties, filters, conditions, and false conditions, and how to diagnose ranking problems. One of the most newsworthy instances of a total ban was when Google, in 2006, issued a total ban to the German website of carmaker BMW (http://www.bmw.de). The offense? Cloaked doorway pages stuffed with keywords that were shown only to search engines, and not to human visitors. The incident became international news, ignited at least partially by the SEO blogging community. BMW immediately removed the offending pages and within a few weeks, Google rescinded the ban. Check Google’s index. In the Google search field, enter the following specialized search query: “site:yourdomain.com.” Google then returns a list of all of your site’s pages that appear in Google’s index. If your site was formerly indexed and now the pages are removed, there is at least a possibility that your site has been banned from Google. Check if Google has blacklisted your site as unsafe for browsing (type http://www.google.com/safebrowsing/diagnostic?site=mysite.com with your domain at the end). Check for Nofollow/Noindex settings. It might seem obvious, but check to make sure you haven’t accidentally set your WordPress site to Noindex. To check, go to your WordPress Dashboard and click the “Privacy” option under “Settings.” If the second setting, “I would like to block search engines, but allow normal visitors” is set, then your site will promptly fall out of the index. A stray entry in a robots.txt file or in your WordPress template file can instruct search engines not to index your entire site. 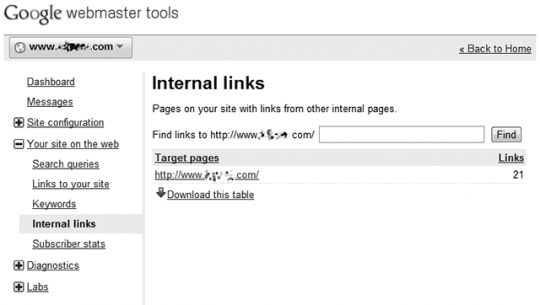 Check Google Webmaster Tools. Sometimes, but not always, Google will notify you through your Webmaster Tools account that your site has been penalized. But you won’t always receive this message, so you can still be penalized even if you don’t receive it. See the image below for an example message. An alternative penalty short of an outright ban is a PageRank adjustment. The adjustment can be partial (a drop from a PR4 to a PR2) or can be full (a drop to PR0). With a PageRank adjustment, Google simply adjusts or removes the PageRank value for a site. Google often imposes this punishment upon low-value general directories that sell links. Part of the difficulty with diagnosing and repairing a PageRank penalty is that the PageRank that Google shows to users is historical, sometimes six months pass between PageRank updates. Check your inbound links. Whenever your PageRank drops, the most likely reason is that you’ve lost valuable links. Check your link profile in Yahoo Site Explorer. Have you lost any premium, high-PR links you had formerly? Use the reliability of the PageRank algorithm to help diagnose: if you have a PR4 link pointing into one of your pages, and that PR4 link has only one outbound link, that one link alone will be strong enough to make the destination page a PR1 or a PR2. If despite such a link your page remains a PR0, that raises the likelihood of a PageRank penalty. Check all pages. Be sure to check every page on your site, you might just have your PageRank shifting around within your site. It is true, however, that generally your home page will have the highest PageRank value of any page of your site. So, if you’ve got a PR0 on all pages including the homepage, a PageRank penalty is suspect. Check canonicalization. Recall the “www” and “non-www” distinction and that search engines see these as separate domains in some cases. WordPress handles this automatically, but some online tools don’t check this for you so you have to be sure your are checking both the www and non-www versions of your domain. Compare PageRank. Compare Google’s reported PageRank score for your pages with SEOmoz’ mozRank. Typically, these two scores will correlate loosely (within about 10%). If the Google score is much lower than the SEOmoz mozRank score, it’s likely that Google is trimming some PageRank. You can see the SEOmoz Page Rank score with the free SEO Site Tools plugin or by visiting https://www.opensiteexplorer.org/. Visible evidence of a Google ranking penalty in the SEO Site Tools plugin; all the elements of a ranking penalty are present. The inbound link count is healthy with over 3,500 links pointing to this domain. SEOmoz' mozRank (erroneously called “Page Rank” in the screenshot) is a healthy 4.41. Nevertheless, Google's PageRank is a zero. This is clear evidence of a Google PageRank penalty. Check internal links. 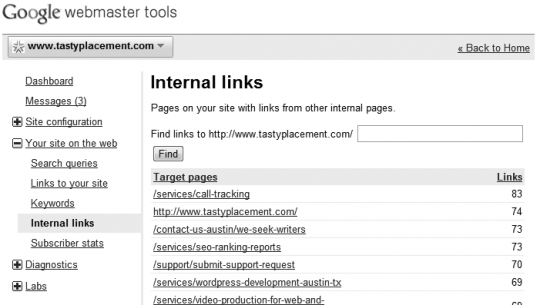 In Google Webmaster Tools, Google reveals its profile of internal links on your site. See the figures below for examples of an unhealthy internal link profile, and a healthy link profile. If your site has 100 indexed pages, but Webmaster Tools references only a handful of links, it means that Google is not properly processing your internal links. We need to be careful here because a range of conditions can cause this. It can potentially arise from a PageRank penalty but also from poor internal navigation structure. This Google Webmaster Tools screenshot shows an unhealthy internal link profile, and is the same site shown in the screenshot just above. This site is a low-value link directory, a likely candidate for a Google PageRank penalty. 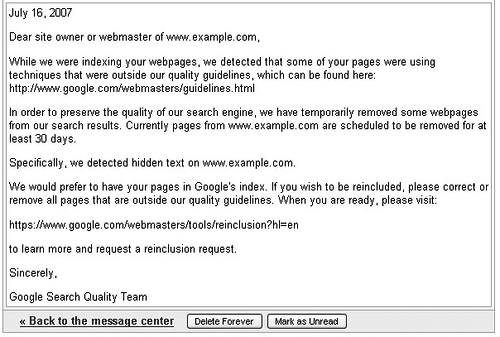 This Google Webmaster Tools screenshot shows a healthy link profile. All or nearly all pages on the website are represented on the internal link profile and the numbers of links to each page is relatively constant. Google sometimes employs a -950 ranking penalty to individual pages (but not to entire sites) for particular search queries. The -950 penalty means that for a particular search, your page would have 950 positions added to it. So, a term for which you ranked on page one of Google’s search results in position three, you’d now rank on page ninety-five of the search results at position 953. Sound harsh? It is, and Google has made faint references to it as a penalty for over-optimization. Some SEO professionals contend that they have seen the penalty imposed for shady link building practices. Diagnosing a -950 ranking penalty is easy: try search terms for which you formerly ranked (hopefully you noted their exact former position) and follow the search results out to page 95 or 96. Remember that you can always set Google to display 100 results instead of ten by using the advanced search option at Google.com, which is convenient for checking ranking position in the 100s and above. Google often serves up another variety of penalty: it’s the -30 or -40 position penalty. This is an often-imposed penalty, and is applied by Google to entire sites, not just particular pages and not just for particular search queries. This penalty is common enough to trip up legitimate webmasters for very minor oversights or offenses. Most signs point to the -30 penalty being applied algorithmically and is “forgivable,” so changing the condition that led to the penalty automatically reverses the penalty. This penalty has historically been imposed upon sites for serving up poor quality content. For example, the penalty has been imposed upon sites that display thin content. Thin content is content that is partially generic, as with an affiliate site repeating common descriptions of products it sells. Low-value directories have also been served this penalty. If you suspect that your site has been been hit with a -30/-40 penalty, there is one sure-fire test to determine if you tripped the penalty. Perform a Google search for your domain name, with out the “www” and without the “.com” or “.net” part of the domain. This search, in normal circumstances, should return your site at or near the first position (depending a bit on the competition of that term). If this test yields your site showing up in a position dropped to the 40s or 50s, it is almost certainly is a -30/-40 penalty. Google penalties are almost never imposed for no reason at all. Yes, Google imposes penalties on light offenders while more egregious violations go unpunished. While that might not seem fair, it doesn’t change the fact that if you have perfectly complied with Google’s Webmaster Guidelines, you are extremely unlikely to be penalized. If you’ve been penalized, there’s a reason.